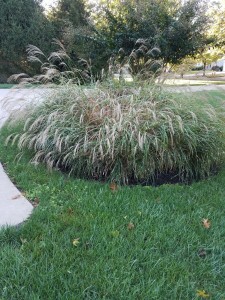 Overgrown grass plants can be divided and replanted. As the seasons change, you will need to be mindful that your property will always require some attention and care. Fall is in full swing and leaves are starting to fall in most neighborhoods in Howard County. In addition to keeping leaves from burying your yard, you also should be thinking about what you can do in terms of fall planting and landscaping! 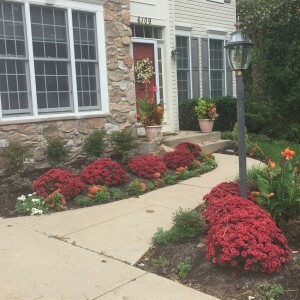 Here are some tips for gaining curb appeal this fall! There are all sorts of beautiful plant life that you incorporate into your yard this fall! Did you know that fall is the ideal time to plant trees and shrubs? This is because the weather is cool; however, roots are able to develop because the soil is still warm enough. In terms of flowers, pansies, perennials, and garden mums are good examples of flowers to consider planting during the fall. After you have planted your new plant life, you may want to consider spreading some fresh mulch. Not only will it help your plants retain water, but it will also offer a nice contrast in color to your new plants. Experienced gardeners know that fall is the time to transplant existing flower or plants. However, you could also consider dividing up flowers or existing plants. It may make more sense to replant your plants in another location and increase your plant population. Beautiful fall mums in Dark Ruby color shown here. When most people think of fall colors, they usually picture various shades of red, yellow, orange, and brown. There are many ways you can incorporate these colors into the exterior of your home. If you are looking to keep things simple, consider hanging a festive wreath on your front door. Another simple measure would be to buy a few pumpkins placing them along your entrance and porch areas. In terms of flowers, pansies, perennials, and garden mums are good examples of flowers to consider planting that will enhance your property’s beauty! This entry was posted on Friday, September 15th, 2017 at 3:39 pm. Both comments and pings are currently closed.